Today’s post I have decided to mention one of the fears I battle with everyday. I think it’s healthy to talk about your worries, so I have decided to express this on my blog… hope you don’t mind! I realise currently it kinda looks like I am scared of toothpaste, and that really isn’t it! haha.. I originally just wanted to talk about how amazing I felt this toothpaste was, but my boyfriend said that post would be really boring! Whenever a tooth of mine ever soooo slightly hurts I kind of panic, I guess I just don’t like the dentist, but I always think of the worst, that my tooth will either fall out, or need to be taken out. (This has happened, but luckily my wisdom tooth has covered that gap) so I guess this has scarred me for a while I guess! Anyway, in August my tooth really hurt when I ate on it.. and I was like oh dear…. got really panicky because it hurt a lot, and I didn’t have a dentist at university, only at home. I decided to give this Sensodyne Extra Fresh Repair and Protect to see if it would help out, since I wondered if I just had a sensitive tooth. A lot of people always told me a toothpaste is a toothpaste and that they are all the same and the cheaper ones are just as good… they really couldn’t be more wrong! 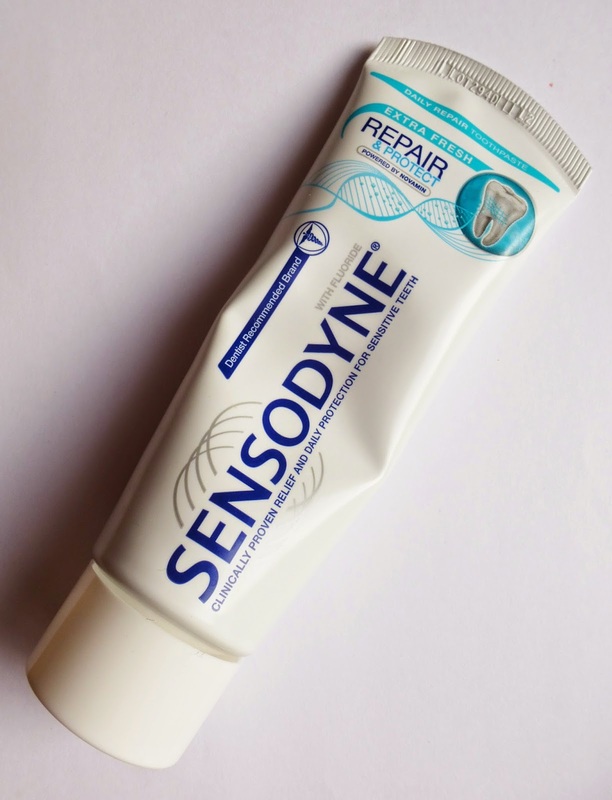 Yes, maybe Sensodyne is a little pricey, but if you can grab it on special offer like I did (£2.99) it isn’t too bad, and it is totally worth it! For one, it actually tastes rather nice, a lot of toothpastes are really disgusting. Secondly, by the time I had booked an appointment and attended the dentist, my tooth didn’t actually hurt anymore. AMAZING?! How does a toothpaste do this…. MAGIC. The dentist said that my teeth were fine, and I just didn’t believe him, and kept asking him to check again just because I was totally confused with why it had hurt so much?! He even took a x-ray and there was nothing wrong! Since then I purchased a different toothpaste because this one wasn’t on offer, so it was £4.45, and my tooth pain has come back 🙁 I have now re purchased this again, admittedly it takes a few weeks or so to work, but I can’t wait for painless teeth again!! In future, I am going to buy this toothpaste whether it is on offer or not, it has become an essential product in the happiness of my life! It also beats any nasty dentist bill any day! I hope this post has helped anyone that may find this product useful! I have this dream most nights! 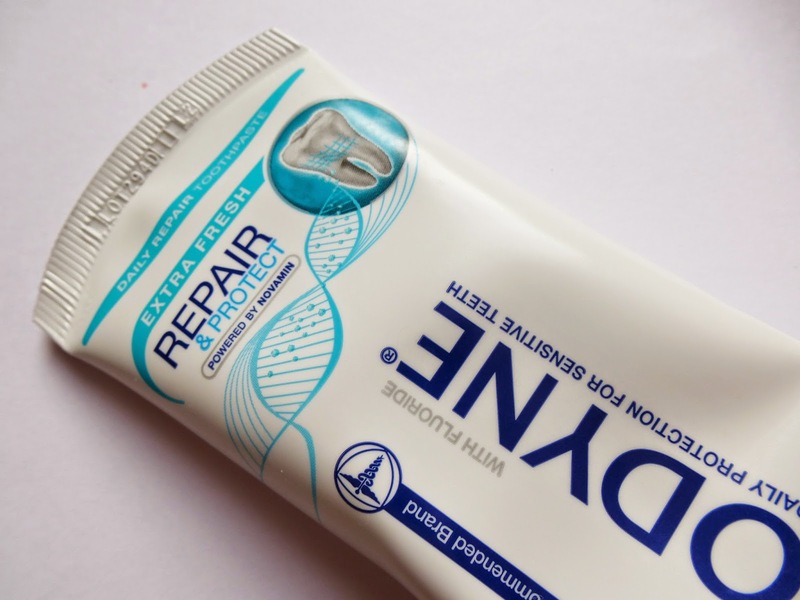 Once I was eating garlic bread, bit down and half of one of my molars fell out and I had to go to an exam the next day with only a bit of a tooth, I was in so much pain 🙁 I may have to pick up this toothpaste, more to soothe my paranoia than anything. Thanks for the recommendation! My teeth are terrible due to me not looking after them as a kid. I'm now paying the price hugely with fillings and I've even had a tooth out (I'm only 18!!! :() so I look after them more now. I haven't gone back to have a filling replaced because I'm too scared of needles and thats why I hate the dentist. I really should though!! I have the exact same fear. I have veneers on my front four teeth and at least once a week have a dream about them crumbling to pieces. Its horrible. Yak! I do use sensodyne though, I think it's brilliant! You can definitely tell when you've stopped using it too 🙂 This isn't a boring post btw ha. Ive found it really interesting and relatable.